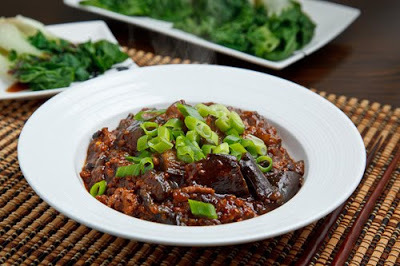 A tasty mapo tofu style dish with the tofu replaced with tender and creamy eggplant. One of my favourite Chinese dishes has to be mapo tofu for its use of not only the chili heat and numbing Sichuan peppercorn combo but also for its use of another great Chinese ingredient, fermented black beans. Mapo tofu or mapo doufu is a dish where tofu and ground pork are served in a tasty chili and bean sauce but I was thinking that it would be nice to try replacing the tofu with eggplant and braising it in the sauce until it was nice and tender. This dish includes a few ingredients that may not be in every pantry but it is well worth the effort to track them down. If you cannot find the dried fermented black beans you can replace them and the garlic with black bean and garlic sauce which is more commonly available in the Asian section of grocery stores along with the fermented bean paste. 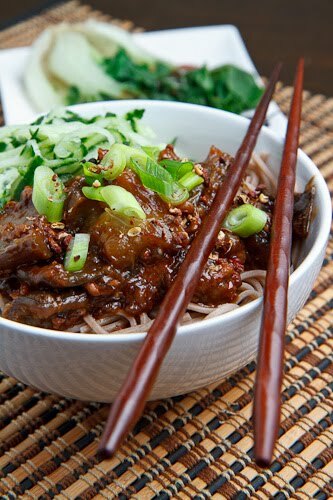 I served the mapo eggplant on noodles, which are said to be lucky on the lunar New Year, garnished with green onions along with shredded cucumber to tame the heat of the dish. Add the ground pork and saute until cooked, about 5-7 minutes. Add the garlic, ginger, black beans, and saute until fragrant, about a minute. Add the eggplant and saute for 5 minutes. Mix in the chili bean paste, fermented bean paste, chili sauce, soy sauce and chicken broth, bring to a simmer, reduce the heat cover and cook until the eggplant is tender, about 15-20 minutes. Mix the cornstarch into the water, mix it into the pan and cook until the sauce thickens, about a minute. Remove from heat, mix in the sesame oil and Sichuan peppercorns and serve garnished with green onions. I love eggplant, but have never had this dish. Looks great! Mmm! I love mabo/mapo tofu! I just made mabo tofu yesterday as a New Year's lunch for my friend. That's a great idea to use eggplant; it soaks all the yummy sauce right up. Thanks for the homemade recipe for the sauce too. My family, despite being Asian, uses the MSG-filled boxed mixes for mabo tofu. We will have to try this some day. Happy new year! where i live it's so hard to find ingredients. I love Chinese pork and eggplant dishes. The ginger, black bean and sesame oil combo is sublime. This is a great recipe. Thanks. Oh, what a wonderful dish and combination! Your mapo looks so scrumptious. Mapo tofu is one of my favorite Chinese dishes too! Never had it with eggplant, but it sounds like an awesome idea. I swear you can almost see the flavor emanating out of that sauce! Sounds like a dish I would adore. This looks and sounds divine…I must try it. Since I'm torn between eggplant and tofu, I'm thinking BOTH!! Happy Year of the Dragon Kevin! I'm such a huge eggplant fan, I'm ready to try any recipe using it. I think you have a good one here! This was amazing! Just made it for dinner. I love how diverse your recipes are. Thank you! I made this for dinner a few weeks ago. It came together so quickly and was so good! I love this dish with tofu, but it doesn't sit well with my fiance, so it's nice to have an alternative. I don't cook with pork, Kevin. What do you suggest as the best substitute? Marlene Bellamy: Turkey or beef would also be good! Enjoy! I've tried many versions of this and love it. I tend to order online but it can be very confusing…. Thanks very much. I love following you…. wonder how you ever get the time to cook and eat all of what you post!! !